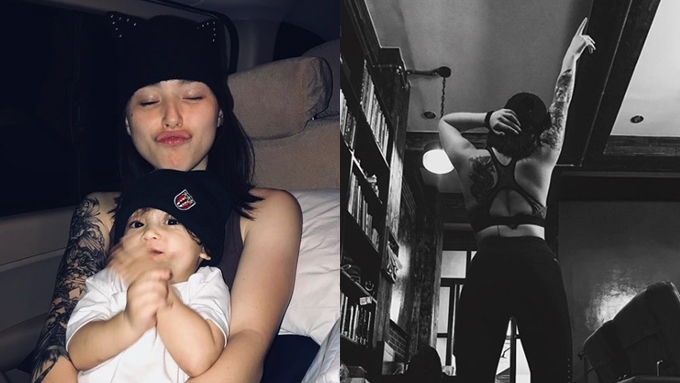 Kylie Padilla champions body positivity for moms: "You're even sexier now." Kylie Padilla takes pride in her post-natal figure: "You're even sexier now, that your body created a human. That's hard effin' work!" Kylie Padilla, wearing body-hugging workout clothes, shows off the elaborate sticker tattoos on her back and on right arm. “A tribute to all mamas out there. Own your body. “Love your body even after making a human being. “You’re even sexier now, that your body created a human. Early this year, Kylie began in earnest her fitness journey—jogging with her partner AJ Abrenica, doing treadmill exercises at home and boxing exercises at the gym, and taking up muay thai training. My more productive days as mama. ???? and yes i lost the baby weight but i want you to know i was happy either way. Fat or skinny, i was and am happy. Instead of being bothered by the extra weight, stretch marks, and other imperfections that come with pregnancy and motherhood, Kylie has felt much more empowered as a woman. In a now-deleted Instagram post, Kylie wrote, “No label or opinion is going to stop me from being proud of myself that first I am now a mother and two, that finally I can choose to be happy no matter how imperfect people or culture says I am. Something that I could never do before."